GIGA GRANADA HILLS: Food Truck Friday: Now With SEATING! Food Truck Friday: Now With SEATING! Tonight at 5pm, enjoy some of L.A.'s best-reviewed food trucks at a special event at the VFW. What's so special about it, you ask? So what, you say, we've got food trucks every Friday? First, you can enjoy your food not just standing on the sidewalk, but on the lovely, waterfall-equipped back patio of the VFW Hall. Second, the VFW has a full bar. 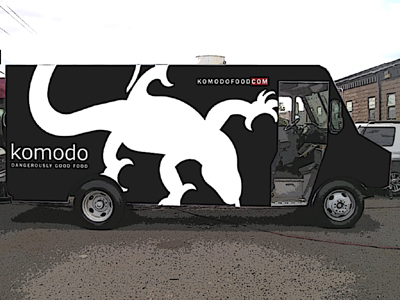 Komodo, The Grilled Cheese Truck, Grill 'Em All, White Rabbit, Gourmet Genie, and O.G. Tempura. How often do you get to enjoy delicious food while SITTING in CHAIRS? And the food truck Nazis are at it again!